Hungarian sculptor. After being apprenticed to his father, a locksmith, Ferenczy attended a course on copperplate engraving at the Vienna Academy where he was awarded for his medal "Solon". He was a pupil of Fischer and Kleiber at the Academy in 1817 where he learnt sculpture. In 1818 he made his way to Rome covering the distance on foot and spent six years on scholarship there. He worked in the workshop of Thorvaldsen, a Danish artist. 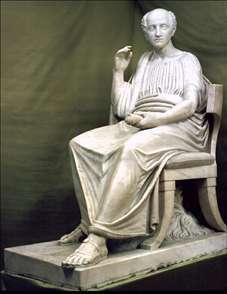 He sent his first works (Reposing Venus, Portrait of Csokonai, Sheperdess or the Beginning of Fine Crafts) to Hungary and they brought him several scholarships and, as a result, he became Canova s pupil for two years. Full of plans, Ferenczy returned to Hungary in 1824. See more details about "Bust of Ferenc Kazinczy"
See more details about "Statue of Poet Ferenc Kölcsey"
See more details about "Sheperdess (Awakening of the Fine Arts)"
See more details about "Old Woman (Zsuzsanna Ferenczy)"